I hate flowers. I hate pink. I have a strained relationship with purple. And after years of bewailing the options for stylish, high-tech, and comfortable cycling jerseys and bib shorts, Santini has heard our cries and created a thing of slight brilliance. While the trend in women’s cycling seems to be moving away from what is “traditionally female,” very few companies are really jumping on the bandwagon like Santini. At last. We have arrived, ladies! 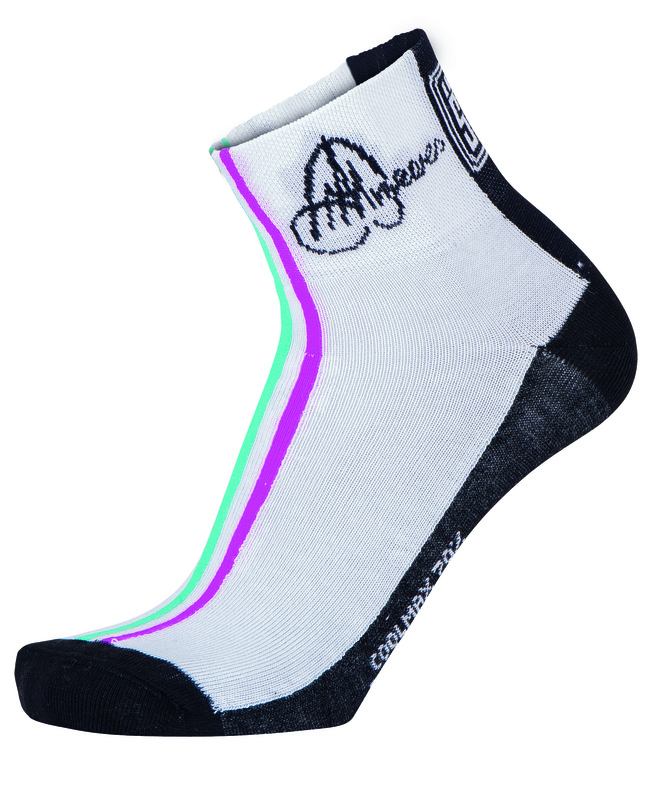 I previewed the 33 Aero selection of the Anna Meares Signature Collection back at Interbike in September, and I have to say I liked the look of things even without actually trying the kit on and taking off down the road. Since then, the kind people at Santini offered me another kit in the Anna Meares line to test–the Tour Down Under Edition. This kit shows thoughtful design from its super soft mock neck to its ultra comfortable gel chamois. As a woman who has to resort to custom team kit orders to find high-end features mixed with cool design, the TDU kit is refreshing as an off-the-shelf option. This kit boasts some great innovations that will benefit even the most recreational rider–and it’s not a bad choice for the racers out there as well. Refreshingly geometric, the design hints at the lines of the track: hearkening to Meares’s racing pedigree (she’s kind of a living legend, btw). 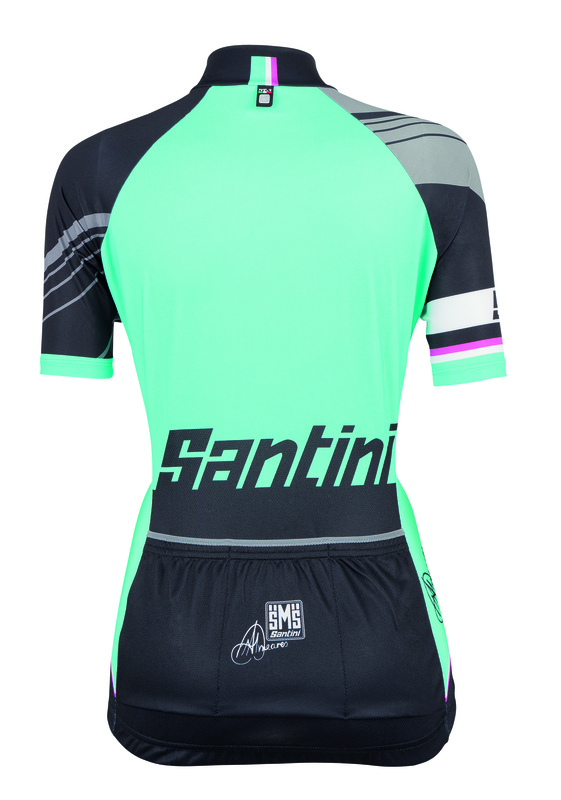 Lo and behold, Santini has found a way to get pink into a kit without putting off those who prefer blue. And, as one who is incredibly picky about how she looks in Lycra, this ensemble pleases even me. Wear it to feel, dare I say, like you can be taken seriously. This jersey actually falls into Santini’s aero categories. The fabric is aerodynamically cut and made from the extremely light and breathable Energy Microsense fabric. The Artico Lycra sleeves lack any sort of grippers, but still stay put without being restrictive or just plain tight, ultimately adding to the aerodynamic capabilities of the fabric. In fact, the material is so light and soft that you just have to feel it to believe it–think silk, but way more competitive. With a little more width and length toward the bottom, this jersey fits a woman’s hips without hanging loosely. No bulkiness, no flapping in the wind, and no heavy fabric to retain heat. Speaking of heat displacement, two mesh panels in the sides of the jersey allow body heat to escape and keep you cooler. These panels are what they say they are: mesh, so they are slightly see-through. But I didn’t notice any serious skin showing–especially with the bib shorts underneath. If you’re worried about your sports bra or something showing, you might want to add a dark base layer to the mix. As for the moisture wicking properties, this may just be the driest kit I’ve ever worn. In fact, I washed it and wore it on the same day and it was completely dry (because you know we don’t put these things in the drier). The fabric stayed comfortable and cool throughout each ride, for hours. Even in the heat of California in January. These shorts hold you in snugly without feeling constrictive. Although I am not a huge fan of the silicone leg grippers (go for the 33 Aero if you don’t like these either) because they tend to squeeze too much and slightly ruin the clean line of the design detail. But the rest of the bib offers a snug feel that’s still slightly relaxed. The Lycra is not as tight as others in the Meares line, so there is a small reduction in the blood-flow quality. But most riders likely won’t even notice the difference–especially when they sit on the oh-so-cozy gel chamois. The GIL2 chamois has a gel core, which doesn’t compress like other foam core pads might. The gel here keeps you riding comfortably for hours, and I do mean hours. Perhaps the most noticeable difference in this chamois and others you might have tried is the extremely low profile. When I first saw the pad, it just didn’t quite seem impressive–I was worried it would be too thin, and subsequently lose its comfort after an hour or so on the bike. Not so. In fact, the pad just didn’t give much at all. Add the gel to internal stitching, which keeps it from contacting your skin, and an ultra soft outer layer, and you’ll find this chamois keeps you from chafing, even without chamois cream. Of all my kits, I have to admit that this is now my favorite pair of bibs because of the indomitable comfort of the GIL2. These bibs also sport cross-front straps. At first, I wasn’t a big fan of the design because it felt almost as if they were pulling on my undershirt/sports bra. But, after a little adjusting (make sure you’ve got these pulled up to a proper wedgie) I really didn’t notice the strap at all. All in all, I didn’t really find a huge difference with the cross-front as opposed to the traditional type of strap. It’s perhaps one of those features that comes down to personal preference. If you’re going to stay fresh and dry, you’d better look great doing it, right? This kit fits very comfortably: think somewhere between the body squeezing feel of an aero kit and a relaxed club cut. I tested it in a medium, and as a woman with a muscular build, it fits very true to size. In fact, I never once felt like an encased sausage here. The construction is flattering without being bulky or loose. And with sizes ranging from XXS-3XL, you will definitely find the proper fit for you. If you’re planning to grab the entire ensemble with matching gloves and socks (seriously awesome), I definitely recommend buying one or two sizes smaller than you normally wear. I tested both in a size medium as well, but I found them to fit quite large. I wear a size eight shoe, and have widish hands, and these mediums were much too big for me. I did, however, love the match and feel of both accessories. The socks sit at just the right height that is popular these days with a thin yet strongly reinforced panel under the foot. The gloves add that extra touch of cool to the kit. 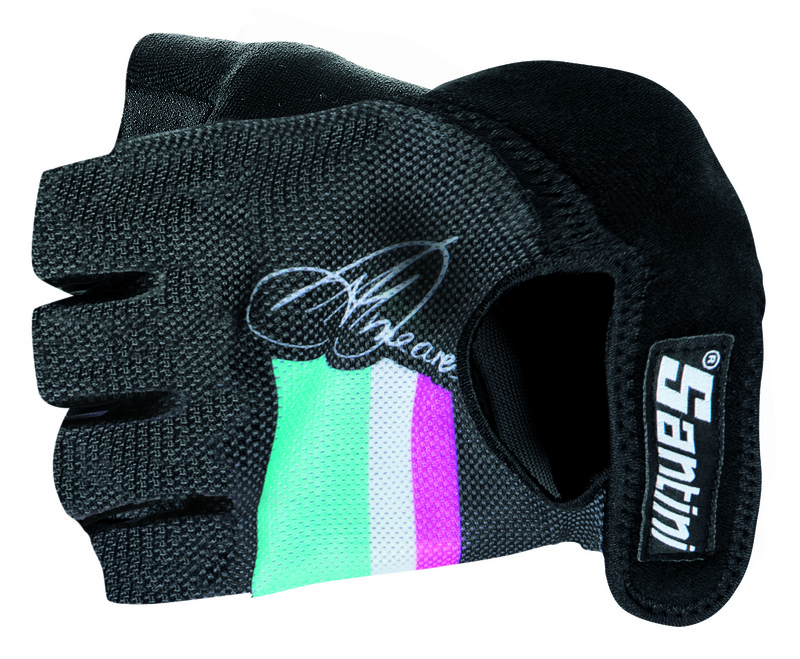 These are fairly simple mesh construction with fabric grippers and foam padding in the palms and thumb. Very light for summer riding. With a fit tailored to a woman’s body, Santini’s Anna Meares TDU kit succeeds in giving female riders a comfortable yet technical option. The range of designs can’t be beat (if you don’t like this one, there are others), and the colors are appealing and add visibility. If you’re in the market for a quality outfit for racing, training or recreational rides, this kit is unmatched for its versatility and style. 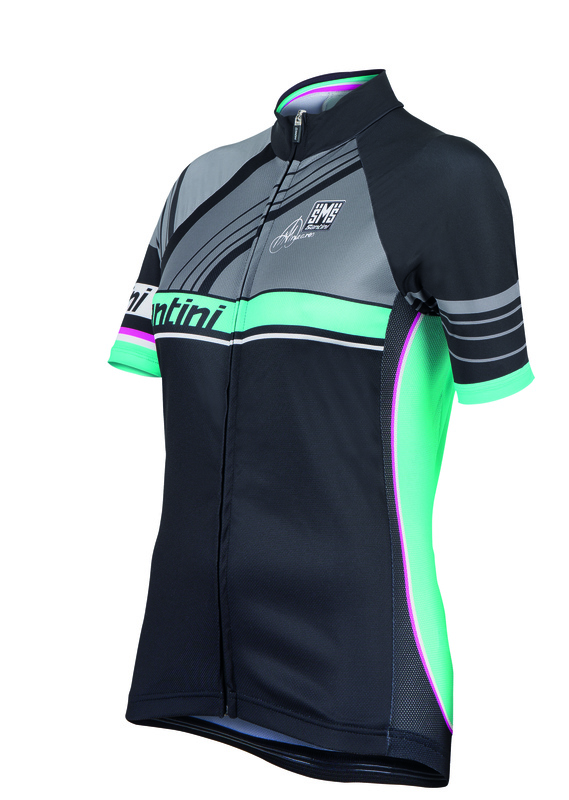 Grab your own ensemble at Santini’s US website, or ask for it at a bike shop near you! Finally bike clothes that don’t look like an idiot designed them!!! Love this!!! Yup, I’m a big fan of the styling too, Anna. Plus the fit really is tailored to a woman’s body–it’s quite flattering.